Laura and I pulled off our wedding on May 19, 2007. 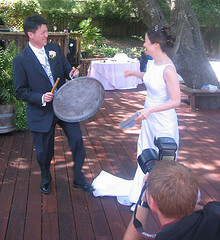 In celebration of our special moment, we engaged in the traditional drumming of the garbage can lid and cow bell. We are indebted to our families and friends for helping to make this joyful day possible. I’ve posted some photos taken by guests.